Last night we headed back to Jervis Bay—a ten-hour passage with 30-knot winds from the southeast and seas of 10 to 13 feet (3 to 4 meters). It was a difficult trip. The pitch and roll motion of the Mermaid Sapphire sent a lot of people to their berths. Some of us were seasick; some had less than an hour’s sleep. Under an overcast sky, we worked from 8 a.m. to 10 p.m. preparing the DEEPSEA CHALLENGER for her second dive. Finally, we lowered her into the ocean with Jim in the pilot sphere. He used a minimum of heat-emitting instruments to reduce the interior temperature. 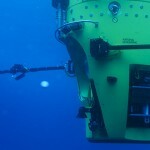 While he was on the surface, Mike deGruy and his team filmed the sub with an underwater 3-D camera. Jim slowly dropped to the seafloor and began checking every system. He drove the sub forward and she responded smoothly. He spun her around 180 degrees. Drawn by the “wall of light,” dozens of fish swam into view. The acoustic communication system had a weak signal and the altimeter wasn’t perfect, but Jim knew that after years of planning and months of construction, he had a sub that could carry him deep. 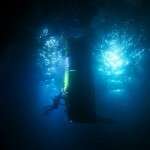 Two hours after he submerged, he dropped the ascent weights and the DEEPSEA CHALLENGER shot to the surface.